What is Urban Greening and why is it important? Simply put, 'Urban greening' is about providing garden spaces with trees, and perhaps other plants to city dwellers. It also aimed at general environmental improvement. Why should we care? Why does our hard-earned tax money go into such projects? 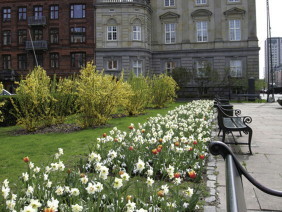 Urban greening was originally a process that aimed to provide urban people with a 'natural' environment, with attendant psychological benefits. There have been some surprising spin-offs from this. It has, for instance been proved that cities that have many trees experience cooler temperatures in summer and have less pollution. Of course, this is logical! Trees provide shade, transpiration (evaporation of water from leaves) helps to cool the air, and everyone knows that trees use up carbon ' the result of combustion ' that issues from cars, factories and coal-fired power plants on a daily basis. But there's more: a new trend towards 'Green Buildings' with 'living walls' (vertical gardening) and roof gardens have shown that plants can help to conserve energy. They're the very best form of insolation and energy saving! Urban greening can even extend to urban farming, a great helping hand for the unemployed who are at least able to contribute to the family table, and even income, thanks to their efforts. A recent move has seen corporate enterprises making roof space available for such projects in densely crowded areas. Another benefit is ecological, and may bring joy to any soul: a good population of plants, preferably plants that are native to an area, attracts birds and other wildlife. The psychological benefits of birdsong have not yet been measured ' what do you think they may be? The truth is that being among trees and other plants inspires and enriches the spirit, enhances the environment and uplifts the individual. Our interaction with nature is part of our instinctive makeup, whether we are city or country folk. Involvement in community greening projects can either create animosity, for example if one or other community leader is seen as being dictatorial, or be a truly positive experience. If you ever happen to be involved with such a project, your diplomacy and leadership skills will determine its success. Urban community food gardens are a great idea provided that suitable space can be obtained. Avoid disputes by agreeing on roles and responsibilities with all involved. The Memo of understanding should be recorded in writing and signed by all parties. Municipalities and local government authorities should also attend to the benefits of urban greening since they are responsible for the wellbeing of the populace in general. Secure and attractive play areas for children are essential, and adults enjoy tree-shaded areas for exercise and relaxation. Countries all over the world are becoming more aware of the need for urban greening, and there are few developments constructed without a few touches from a landscape architect ' even if this is not required by law, as it is in some cases.